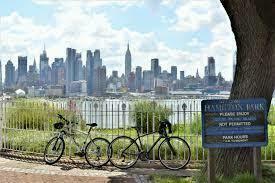 Description: 31 miles - Leaving from Liberty State Park and traveling north to Palisades Park and back. This ride will encounter some of the best views of NYC that Jersey has to offer. The route is mostly flat and can have a fair amount of wind, but also has a couple of steep climbs in the middle as we approach and travel through Palisades Park.